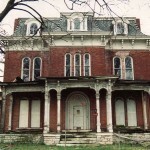 This 1869 mansion is the site of many strange happenings. It has been seen on the TV show Scariest Places on Earth. Apparitions have been seen in the hallways, and children’s laughter has been heard. Unfortunately the ‘Scariest Places on Earth’ crew is sort of infamous in Alton right now for having made up a bunch of stuff just for the show, and ignoring information from local experts. Alton is full of rich history and is definitely worth visiting for its paranormal locations. The Mineral Springs Hotel is probably the best place to get started, followed by the First Unitarian Church. These are fairly easy to gain access to via tours that run every October.